In 2004, the U.S. Army made a colossal mistake. It introduced a new digital camouflage called the Universal Camouflage Pattern (UCP), a single pattern designed to work across all environments. Only a few months later, however, as the war in Iraq was intensifying by the day, every soldier on the ground knew the truth: by trying to work in every situation, UCP worked in none of them. Unfortunately, the race to find a pattern that actually works—a race officially known as the Army's Camouflage Improvement Effort—has been its own kind of debacle. In 2012, The Daily called it a "$5 Billion Snafu." The competition solicited new patterns from hundreds of camo designers, then whittled the entries down to four finalists. After four years (and millions of dollars), the Army seemed ready to pick a winner. The four finalists selected by the army included patterns from Brookwood, Crye Precision, Kryptek, and ADS Inc. with Guy Cramer. Yet the delays have continued. The latest rumor was that the entire Camo Improvement shebang was about to be cancelled. Instead, the theory went, the Army would simply adopt MultiCam, a digital camo made by the Brooklyn company Crye Precision, which has served as a stopgap measure since the revelation that the Universal Camo pattern didn't work. Yet that hasn't happened yet, either—and the tale grows stranger. Back in December, Congress introduced a bill that would block the Army entirely from introducing a new pattern this year. By 2018, however, the bill would require the entire Defense Department to adopt the same pattern. Politicians, it seems, are sick of spending money on this never-ending problem. In response to my request for comment from the military itself, spokesman William Layer could only tell me the following—that "the Army is weighing numerous options and are factoring in recent legislative restrictions." Amidst accusations of general incompetence and bureaucratic red tape, there's also the fact that warfare technology is rapidly evolving—and no one can predict quite how camo will need to adapt in the long term. The burgeoning field of military science that revolves around how our eyes interpret—or misinterpret—information—is still very young. And flinging billions of dollars at the problem hasn't had the intended effect. Today's camouflage has a relatively short history. At the birth of modern warfare in the 18th century—when long-range rifles emerged—the concept of camouflage involved dressing in forest green or field grey. By World War I, troops were experimenting with "dazzle" that made it difficult to gauge the proximity of a ship in the distance. Soon, the technique was being used on humans. 1917: A soldier in World War I models early camouflage. Image via the National Archives/Department of Defense. At the dawn of World War II, the distinctive kidney-shaped splotches of more contemporary camo had emerged—and things escalated quickly from there. By the end of the war, modern painters had even helped develop optical patterns to fool the eye, borrowing ideas from Cubism and Op-Art. An Allied soldier during World War II. Image: gunbarrel on US Military Forum. In the late 1970s, though, the Army introduced a new (and unpopular) type of pattern called "dual texture," an early forerunner to the "digital" camo we know today. Dual-tex used perfect squares of color to mimic two patterns at once: one smaller, and one larger, effective at multiple distances. It was an early forerunner to digital camo, but it wasn't until the 1990s that camo developed on computers emerged—and, with it, a renaissance in the scientific study of camo. An army officer named Timothy O'Neill, "the grandfather of modern camo," pioneered the genre with his small squares of color that were able to trick the eye into seeing a camouflaged soldier or truck as part of the background of a scene. Dual-tex camo from the 1970s and 1980s. Image: United Dynamics. Why did pixels do a better job that traditional blobs? Because pixels are better at mimicking fractal patterns—which our eyes interpret as white noise. By looking less like figurative "nature," digital camo gives our eyes nothing to fixate on. But the eye is a complex piece of anatomy—and recreating the same optical trick for millions of soldiers in an infinite number of environments is nearly impossible. As a result, a cottage industry of independent contractors and engineers has sprung up, each hocking their own unique variant of digital camo—including the four finalists in the Army's Camo Improvement effort. Find the US4CES: An image shows Guy Cramer and ADS Inc.'s finalist entry in the camouflage competition. Image: Hyperstealth. Some of these companies declined to comment when I contacted them for this post, most likely because the army's winner announcement was still to come. But one in particular—Guy Cramer, CEO of Hyperstealth Biotechnology Corp, designer of camo for the armies of Jordan and Afghanistan and one of the four finalists in the Camo Improvement effort—was kind enough to answer many of my questions about camo design and the army's attempt to improve it. As Cramer explained to me, digital camouflage attempts to use advanced optical tricks to confuse the brain into missing the body of a target, rather than simply "blending in" to the surrounding landscape. "You can't just throw paint on a wall and call it camouflage," he says. "We're not necessarily trying to create randomness. We want the brain to interpret patterns as part of the background." Affecting that kind of visual trickery is a tall order. It involves ideas about color science, the anatomy of the human eye, and even the logistics of pattern-making. And it's still not perfect. Let's take one of the biggest shortcomings the Army's failed digital pattern, UCP: the scale of the pixelated patterns. The Army's failed Universal Camo Pattern, or UCP. All digital camo has two layers: a micropattern (the pixels) and a macropattern (the shapes the pixels form). If the scale of the macro blobs is too small—as they are with UCP—it triggers an optical phenomenon called "isoluminance," rendering the carefully-constructed camo pattern into a light-colored mass. In other words, it makes it incredibly easy to spot targets from a distance. That was one of the biggest problems with UCP, as you can see. An example if isoluminance from Hyperstealth's website. The so-called "boundary luminance" in Cramer and ADS Inc.'s US4CES. "If you don't have at least a percentage of that on your camo, it will stand out and look very 2D because it doesn't have that depth effect," he explains. "It was a hard lesson learned." There are more than half a million soldiers in the Army right now—and printing and cutting enough uniforms for all of them (at the lowest cost!) presents its own unique problem. It's important that camo "breaks up" the outline of soldier's body at crucial points like the wrist, knee, and ankle. US4CES photographed by Predator BDU. Just like a tiger's stripes, which run perpendicular to their limbs, these visual "breaks" help to disguise the anatomy of a human target. When a roll of camo fabric is being cut up into millions of uniforms, however, it can be tough to predict where these breaks will land. Likewise, our brains are very good at recognizing patterns—if we see one shape twice, we're instantly aware that something's up. So it's incredibly important that a uniform's left and right sides don't ever match. "A lot of patterns will have this issue," says Cramer. "The brain will see an anomaly on the right part of the chest, and if it sees a very similar pattern on the left side of the chest, the brain immediately connects the dots and says, I now see the top part of a human body." Cramer's success has come, in part, because of his ability to engineer patterns that meet all of these complex criteria. He is a pioneer of algorithmic camo design: Rather than relying on his own brain to design patterns, he writes programs that generate true geometric fractals. Fractals, like the classic example of a leaf, are mathematical patterns that repeat themselves at any scale. Self-similar geometries found in Google Earth by professor Paul Bourk. Without a reference for scale, our eyes can't differentiate between a fractal and the background. That's why Cramer's patterns have been used on everything from guns to helicopters (not to mention more than 2.5 million uniforms): Because they are scaleless, they hide objects that are as small as humans and as large as buildings. The art of testing these patterns is almost more important than the design itself—and it's a process Cramer knows well, because he's helped the Army test patterns for nearly a decade. The process involves quizzing the Army's best snipers using thousands of photographs. U.S. Soldiers Explore Abandoned Shopping Mall in East Baghdad. Image: Getty/Chris Hondros. At the United States Military Academy at West Point, the test subjects—which include snipers with perfect-or-better vision—don eye-tracking gear and are ushered into an immersive theater where they're shown slide after slide of camouflaged soldiers in different environments. There are a huge range of images to go through: For every conceivable environment, from deserts to marshes, and every conceivable weather event. Beyond environmental information, there are issues like range: a pattern must perform well close up as well as far away. According to Soldier Systems, the Camouflage Improvement Effort had 900 subjects test each pattern in 45 environments, resulting in a total of 120,000 data points. A crucial part of the testing process isn't just how quickly subjects can identify a visual anomaly—it's about how quickly they can identify where the body of the soldier is actually lying. That millisecond decision can have a huge impact in the field where, according to one NBC report, identifying a target take the average sniper only 12 to 30 seconds. In late August, a Special Forces team was unexpectedly removed from a mission in Libya, after terrorist groups stole dozens of guns and gadgets from US Army trucks. What does that have to do with camouflage? Everything, actually. Along with machine guns and lasers, the raiders stole a gadget that could eventually do just as much damage: A special type of US Army night vision goggles that detect short-wave infrared light—aka the SWIR spectrum. At $45,000 a pop, these goggles let soldiers see at around 1 μm wavelength, where colors blend together into a white mass. In other words, they make camouflage completely useless. The only pairs in existence have rested safely in the hands of the U.S. Army, until now. Hence the pull out. "It was never an issue up until now," explains Cramer. "Now, you've got the bad guys running around with the same tech." Which hints at the underlying explanation for the camo snafu, beyond sequestration or inter-agency spats: as enemies change and the supply channels for the latest military technology evolve, the Army can't be sure what exactly the other guys are seeing when they peer over the horizon at their troops. We've come along way from the stone-grey or field-green camo of the 19th century. We've even come a long way from the 1960s and 70s, when a single pattern could do for many decades and many conflicts. Modern warfare is changing at a dramatic speed—and, even when the Department of Defense picks a new pattern this year or next, it won't be long before they will be forced to reevaluate it. A concept image for Hyperstealth's "Smart Camo" textile, which can't be shown Image: Wired UK/Hyperstealth. It's almost as if the Army isn't looking far enough into the future—where rapid prototyping and smart materials could generate new patterns and textures simultaneously as field conditions change. Hyperstealth, for example, is working on a project called Quantum Stealth—a light-bending camo project that's been called an "invisibility cloak" in the media. One project, sadly, that its creators just can't discuss yet. 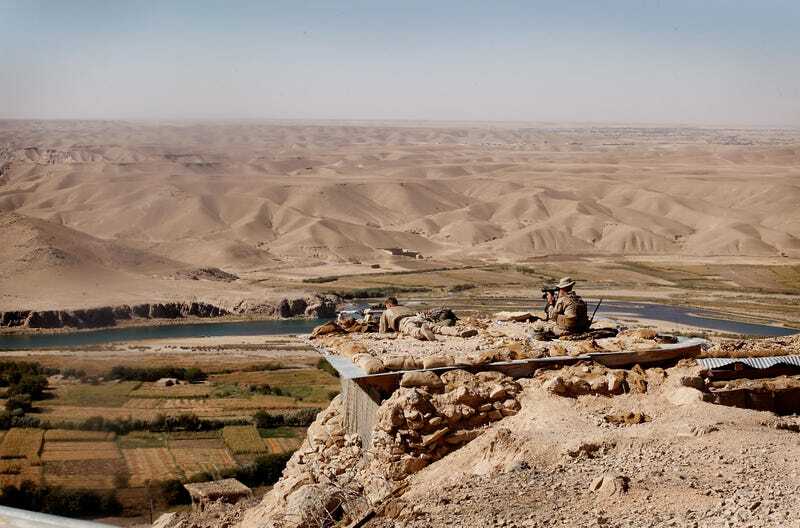 Lead image: US Marines Patrol Remote Part Of Helmand Province Near Kajaki Dam. Scott Olson/AP.